Based on the popular sundae served at Brooklyn Farmacy and Soda Fountain, this unique sundae has vanilla ice cream, potato chips, peanut butter and caramel. About a month ago, I was at a bookstore, browsing through the cookbook section. I came across a copy of The Soda Fountain and was smitten from the beginning because of the cover. Yep – I totally judge a book by it’s cover. 🙂 I put it on my never ending list of books that I wanted to buy. But lucky me, not long after, I was offered a copy for review. I couldn’t pass it up – especially since it’s the perfect time of year for a book all about ice cream floats, sundaes, egg creams and more! When I was in Jr. High, I had a friend who’s father was a pharmacist. He worked in a pharmacy that actually had a soda fountain. I remember going with her often after school, ordering hamburgers and milkshakes or banana splits and putting it on her dad’s tab. Although that soda fountain closed sometime while I was in high school, I had such fond memories of that place. 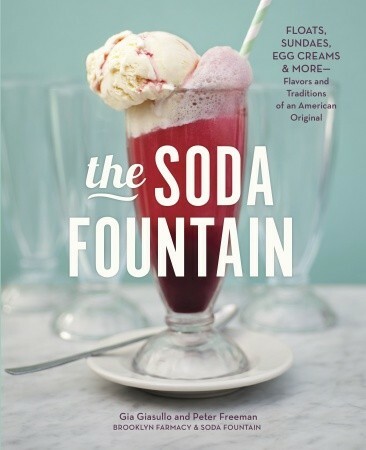 The Soda Fountain, by Gia Giasullo and Peter Freeman of the Brooklyn Farmacy and Soda Fountain, is more than just a cookbook with recipes for ice cream floats and sundaes. It’s a story about the nation’s history of soda fountains and how communities were built around them. In 2010, the Brooklyn Farmacy and Soda Fountain opened it’s doors, bringing back the nostalgia of the soda fountain. But while they feature the favorites of years past, like the Brooklyn Egg Cream or black and white float, they bring a whole new twist with recipes like their Makin’ Whoopie! Sundae (whoopie cakes, ice cream and hot fudge) or the Cookie Monster (mint chocolate ice cream, chocolate chip cookie crumble, hot fudge, whipped cream, walnuts and blue sprinkles). 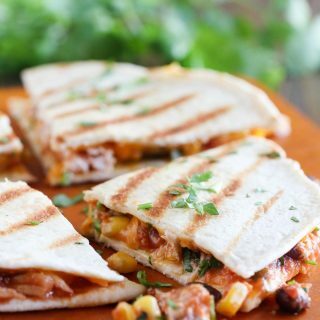 This book is full of great recipes that the whole family will have fun with. 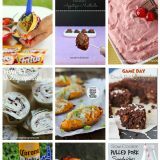 There isn’t a photo of every finished recipe, but there are quite a few photos. I especially loved all of the historical photos, as well as the step by step photos for a few recipes like the egg creams. The recipes are for the most part quite easy. Some do take a little bit of time to complete elements of the recipe ahead of time, but once everything is prepped, they all come together easily. 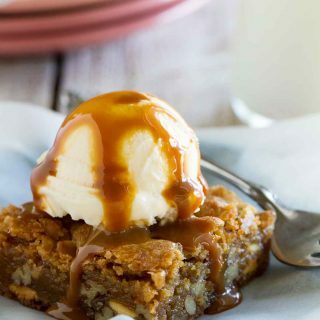 I did make the caramel from one of the recipes, and while I have been hit or miss with caramel in the past, the instructions in this recipe were so clear which made it much less intimidating. 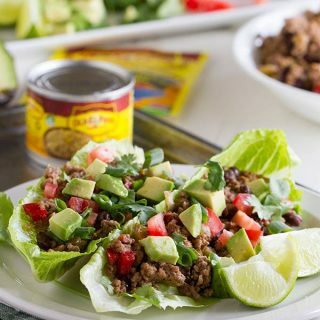 Most of the ingredients are readily available. 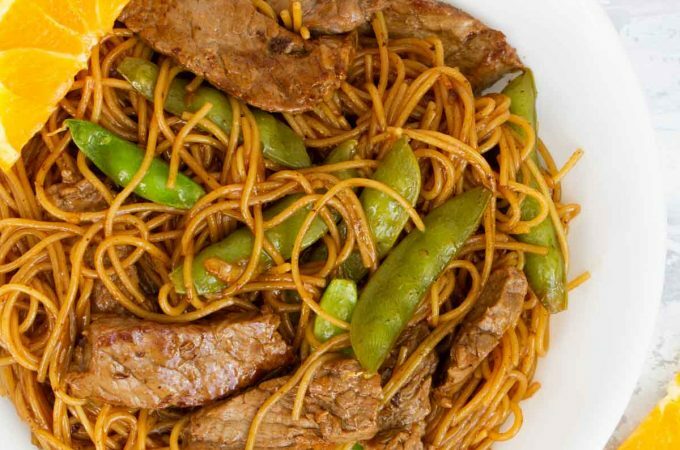 The recipes do call for cane sugar over regular sugar (I did not use cane sugar in the recipes I tried, though), or more obscure ingredients like li hing mui powder, The Redhead’s Bacon Peanut Brittles, or blanched Valencia or Virginia peanuts. But there is a resource list in the back of the book that tells you where you can purchase most of the harder to find ingredients. 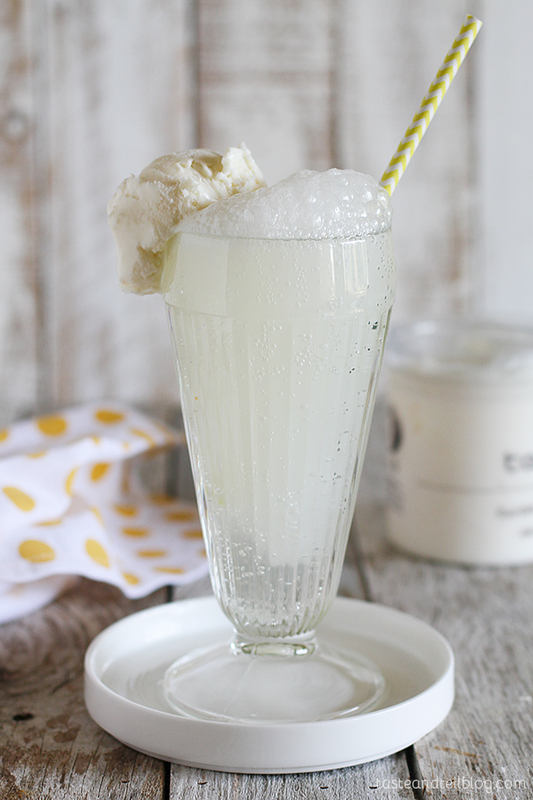 For this float, you make a pineapple syrup, then serve it with seltzer and coconut ice cream. The pineapple syrup was very easy to make, although you do have to make it a day in advance. I couldn’t find coconut ice cream, so I used my favorite gelato, which worked perfectly except for the fact that it was hard to get a good scoop to sit on the side of the glass – it was a little too soft. But that was really not a problem since I just pushed it into the float. I will admit that I’m not the biggest float fan normally, but I couldn’t get enough of this. 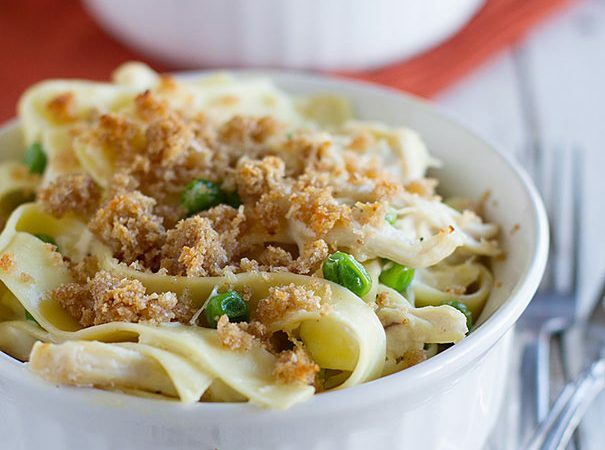 And I think this was my husband’s favorite of the three recipes. 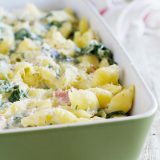 The minute I saw this recipe, I knew I had to try it. This is totally something I would order if I saw it on a menu. And it didn’t disappoint! 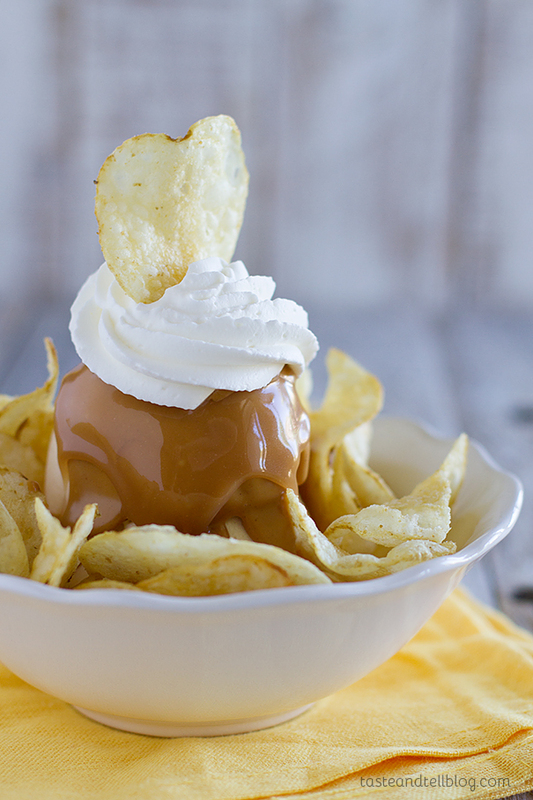 I love the sweet and salty combination, and I seriously think I will be dipping potato chips into peanut butter and caramel from now on. SO good!! 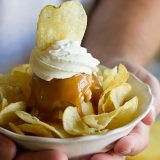 The caramel sauce is made from scratch, and has a bit of honey which sets it apart from other caramel recipes I’ve tried. There is also a recipe to make the peanut butter from scratch, but I didn’t have the exact ingredients, so I took a short cut and used regular peanut butter from the jar. This was definitely my favorite, and I will be eating this combination more often than I should, I’m sure!! Such a fun book!! I can see myself reaching for this book on family night as a special way to finish off the night. Or for a treat on the weekends. 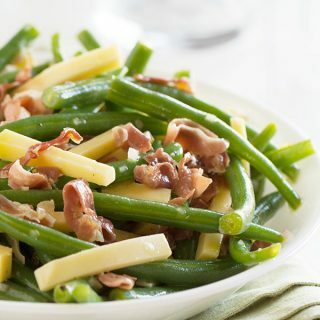 I love that there are classics as well as different, creative recipes. And I definitely have the Brooklyn Farmacy on my list of must-visit places next time I’m in New York!! Pour the water into a large, heavy saucepan with high sides. Add the sugar in a stream to the middle of the water, being careful to keep the sugar in the middle of the pan to avoid sugar crystals forming on the edges of the pan. Pour the honey into the middle of the pan. Bring the mixture to a boil without stirring. Cook until it becomes a dark amber color or when it registers 305F on a candy thermometer, 10 to 15 minutes. If any scum forms on the surface, use a spoon to scrape it off. 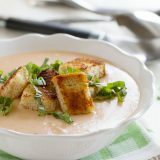 Remove the pan from the heat and add 1/2 cup of the cream. The mixture will bubble and spit, so stand back and allow it to settle for a moment before adding the remaining cream. Whisk until the cream is incorporated, then start adding the butter, 3 to 4 pieces at a time, whisking for 10-15 seconds before adding more butter. Continue to whisk until the butter is melted and incorporated. Add in the vanilla and salt. Store in glass jars in the refrigerator for up to 2 weeks. This recipe makes 4 cups, but you will only need 1/4 cup for each serving of the sundae recipe. Place the 4 oz. scoop of ice cream in the middle of a bowl. Top with the 2 oz. scoop. 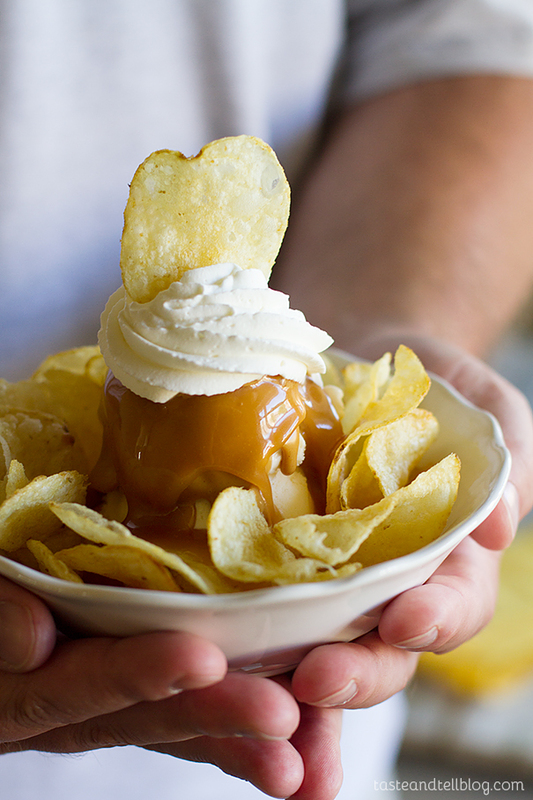 Place the potato chips around the ice cream. If needed, microwave the peanut butter in 10 second increments until it is pourable, then pour over the ice cream. Top with the caramel sauce, then the whipped cream. Serve immediately. You said you were really into maple lately (so am I 0 but I could not find anything about maple in your blog??!! What a fun book! 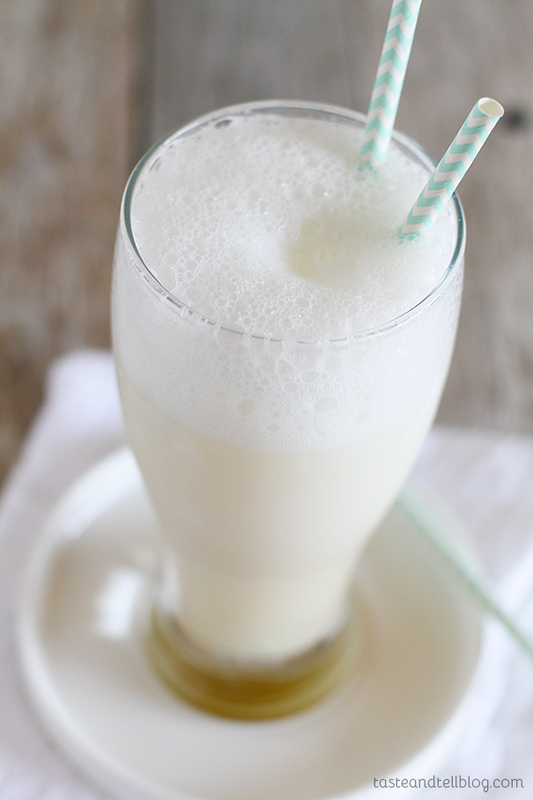 I have never had a Maple Egg Cream either and now I am curious to try it! This is SO fun! Might have to be my next Blogging For Books choice, if there are still any left!